The interior dining room . Photo: Dana Massey-Todd. © tablehopper.com. A view of the kitchen. Photo: Dana Massey-Todd. © tablehopper.com. 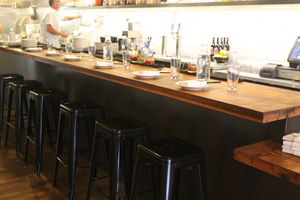 Mau’s bar seating. Photo: Dana Eastland. © tablehopper.com. 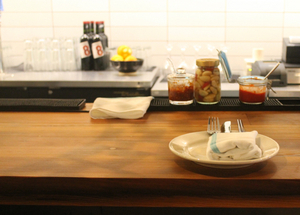 The bar set with some of the housemade sauces and pickled garlic. Photo: Dana Massey-Todd. © tablehopper.com. As previously mentioned on tablehopper, Sante Salvoni is back at the ovens and about to open a new restaurant on Valencia. His partners in the venture are Hung Dang (Tin Vietnamese in SoMa) and husband-wife team Annie Abbott and Luke Wendler. 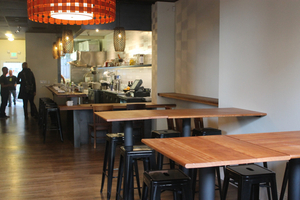 The new spot is called ~MAU~ and will be all about Southeast Asian dishes, especially street food. Despite some false internet rumors, the spot has not opened yet, but Salvoni is hoping to have the place up and running, at least softly, by Wednesday (yep, that’s tomorrow!). They did a trial service last night, and we got a chance to peek at some of the dishes that they’ll likely be opening with. Look for lettuce-wrapped housemade pork sausage with pickled vegetables and mint; minced pork noodle soup in gai lan spicy tomato broth; a lemongrass tofu rice bowl; grilled pork shoulder rice bowl with pickled vegetables; and mustard green-wrapped halibut with housemade shrimp paste, crispy rice, and tomato dashi. Most of the dishes will be sized for individual consumption, as opposed to family style, and will be less than $15. There will also be some larger entreés for sharing, like a whole fish, which will hover around $25. They’ll be open for lunch for now from 11:30am-2:30pm Mon-Sat, and for dinner Mon-Thu 5:30pm-10pm and Fri-Sat 5:30pm-11pm. They are closed on Sundays. Eventually, they plan to be open from lunch straight through dinner, but for now they need that break to make sure everything’s running smoothly. The upstairs mezzanine. Photo by Scott Saraceno. 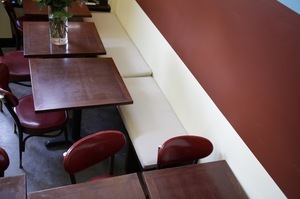 The tables and banquette. Photo by Scott Saraceno. 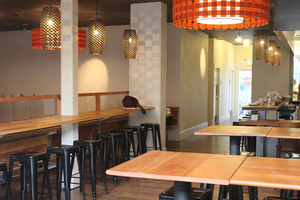 About a month ago, tablehopper broke the news about the name of the new restaurant opening in the former Tao Café space at Guerrero and 22nd Street: ~COMPANY~. Or as I like to remember it, the old Flying Saucer space. Anyway, chef-partners Karen Hoffman and Jason Poindexter (previously of Four Seasons) are partnering with Thuy Nguyen, the former owner of Tao, and are serving a menu of Cal-Mediterranean and Northern California cuisine in a relaxed setting. The menu was designed to be flexible for a quick bite or full meal, and includes appetizers from $6-$10 and entrées from $14-$16. Some starters may include housemade ricotta cheese with roasted figs, balsamic reduction, and levain toasts; grilled Monterey squid with crushed Butterball potatoes, pancetta, and salsa verde; and pickled watermelon salad. There is also pappardelle with oxtail sugo and braised beet greens; two kinds of flatbreads; and mains like slow-roasted pork shoulder, crispy okra, corn succotash, and housemade pancetta; roasted chicken panzanella salad; and sockeye salmon with fresh shelling beans, braised romaine, confit fennel, Castelvetrano tapenade, and herb salad. Oh yes, and there’s a burger too. The restaurant softly opened for dinner last Friday, and will start lunch service Tuesday October 2nd. The space is a bit retro-meets-industrial look, with vibrant colors on the walls and vintage light fixtures. There’s a bar with room for eight, plus a lounge upstairs (available for private events). There are also some creative soju-based cocktails on the menu, by Russell Morton, who is making soju-based gin, amaretto, and barrel-aged fortified wine cocktails (they are mixed in-house and then aged in oak barrels). There are also wines on tap, along with craft beers on tap and by the bottle (all local and small production). Open for lunch Tue-Sun 11am-2:30pm, bar and dinner Sun and Tue-Thu 5:30pm-10pm, and Fri-Sat until 11pm. Lauren Kiino (left) at Il Cane Rosso; photo from Facebook. Over the weekend I got a note from Lauren Kiino of ~IL CANE ROSSO~ in the Ferry Building Marketplace about not just one but two new SoMa projects she is working on: ~RED DOG~ and ~FEARLESS~ (you may have seen the story in the Scoop here). The bigger project is Red Dog, which will be opening in half of the former Maya space on 2nd Street (who is moving into the other half is TBD). The 75-seat restaurant will be a casual spot to swing by for lunch or after work, serving rustic cuisine that’s a bit American or British or Italian or French (not unlike what you’d find at Il Cane Rosso, which means “red dog”). Dishes may include a vegetarian pasta carbonara made with kale, mushrooms, and salt-cured egg yolk; chicken-fried pork chop; wild nettle and mushroom-potato hash. And I’m also happy to hear that Il Cane Rosso’s awesome Scotch egg will be on the menu. Kiino says they’ll be serving “real entrées, like grandma-meets-farmhouse cooking”; she will be working closely with Emily Martin, her sous chef at Il Cane Rosso. There is also a bar (with 25 seats) and there will be a full liquor license. Timing is late spring or early summer 2013. 303 2nd St. at Harrison. The second project, ~FEARLESS~, is going to be a café opening in a nearby space that previously was a Tully’s, serving quality coffee from a local roaster, breakfast sandwiches, and other breakfasty items, and grab-and-go sandwiches and salads for lunch, plus some hot items. Fearless has the same timing as Red Dog. The Pig & Pie interior. Photo: Dana Massey-Todd. © tablehopper.com. 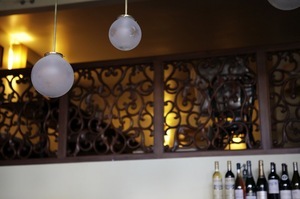 Bar Bambino interior (photo from website). The rumors are true: ~BAR BAMBINO~’s chef Lizzie Binder will be on the upcoming Top Chef: Seattle, according to Grub Street, and contrary to earlier reports, she will not be returning to the restaurant. The new season of Top Chef airs November 7th. 2931 16th St. at South Van Ness. Over in the Mission, Eater reports chef Nate Overstreet has left ~PIG &AMP; PIE~, along with his lady, the pie maker, Ashly Amador (sound like the makings of a good novella). Owner Miles Pickering is currently on the hunt for replacements. 2962 24th St. at Alabama. ~TUPELO~ in North Beach has a chef turnover: chef Mark Danzinger has moved on (Eater mentions he’s going to be opening his own restaurant), and his replacement is Michael Hadj, who is keeping the Southern comfort food style but making some updates (he’s adding chicken and waffles with bacon jam and Southern pulled pork pie). Tupelo also landed its entertainment permit, so look for some live music. 1337 Grant Ave. at Green. In the not-shocking department, ~BIA’S RESTAURANT AND WINE BAR~ in the Upper Haight has closed, according to Upper Casing. The space is reportedly going to be renovated and then put on the market. 1640 Haight St. at Clayton. Eji’s red lentils and injera. Photo from Facebook. The fine folks at ~331 CORTLAND MARKETPLACE~ have some great news: the newest vendor to join the market place is Eji Atlaw of Eji’s Ethiopian. She is taking a big step forward in her business after beginning at La Cocina and is replacing Claire Hoyt’s Big Dipper Baby Food, who left in early September to focus her business on online sales. Atlaw will be serving her wonderful Ethiopian plates, with some side options. 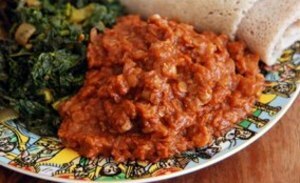 Her signature dish, misir wot, is a plate of spicy red lentils, with injera and sautéed greens. She was serving it at the SF Street Food Festival, and it was awesome. There will also be split yellow peas, her injera rolls in both slightly spicy and mild, and you’ll have the option of getting sautéed greens or turmeric cabbage with your plate. She’ll be offering prepared sauces and meals to take home, too, as well as a thyme herbal tea available either hot or cold. There’s no exact opening date yet, but she’s looking at mid-October. She doesn’t have a phone number quite yet, but in the meantime you can check out her Good Eggs page and start getting hungry. 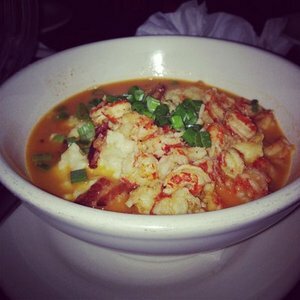 Crawfish grits. Yelp photo by Tiffany U. My editorial assistant heard word that the chefs at ~BROKEN RECORD~ were off to do their own thing, which was confirmed by this Craigslist ad I spotted yesterday. 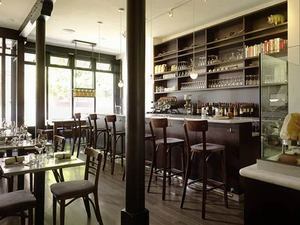 But before we could get a call back, the Scoop announced chefs James Moisey and Shane LaValley are in fact leaving Geneva Avenue in a month or so, and will be opening their own place in the Lower Haight, in the former Rotee space. They are hilariously calling the space rickybobby—yes, it’s a reference to Talladega Nights. Look for the same menu (bacon burger, crawfish grits) and 45 seats. A beer and wine license is under way; late fall is the plan. 400 Haight St. at Webster. LiveSoMa reports ~EDDIE RICKENBACKER’S~ has reopened, sans motorcycles. Click through to view a menu. 133 2nd Street at Mission, 415-800-6659. 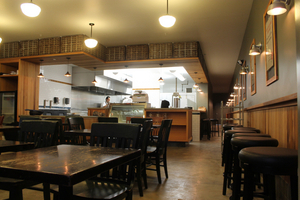 Inside Scoop reports ~GOAT HILL PIZZA~ has opened their third location, in West Portal. Open daily 11am-10pm, and delivery is available. 170 West Portal at 14th Ave., 415-242-4628. 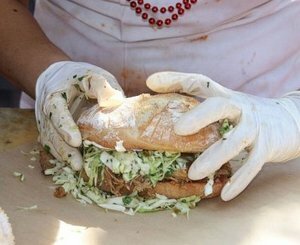 One of the food options from Picnic in the Street: the pulled pork sandwich from the Pasta Shop. Photo from Facebook. If you’re in the market for some local artisanal products from unique purveyors, look no further than the Meet Market at ~BLUXOME STREET WINERY~. Oh, and did we mention you can sip on wine while doing your shopping? Yeah, not so bad. Check out the rillettes and other meaty goodies from Wooden Spoons, or the pickled vegetables from Paulie’s Pickling, or perhaps some cheese from Orland Creamery Farmstead is more your speed. Regardless, they’ll all be on offer the last Saturday of every month from 12pm-5pm, which means this month’s will be Saturday September 29th. 53 Bluxome St. at 4th St.
Over in Oakland, catch the fall celebration ~PICNIC IN THE STREET~ on Sunday October 7th, to coincide with the Rockridge Out and About festival. 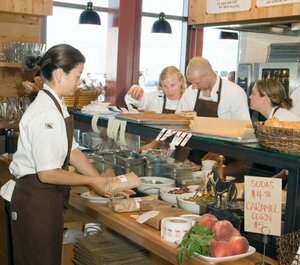 Merchants from the Rockridge Market Hall will be out in full force, offering food, tastings, and demonstrations. There will also be a bunch of fall-flavored activities for kids, like a pumpkin painting booth and goat petting zoo. Paul Marcus Wines will be on hand, pouring sparkling, rosé, and red wines, so there’s plenty of fun for adults too. For a full list of participating merchants, check out the list here. Attendance is free, with food and beverages available for purchase. The event will take place from 12pm-6pm, at and around the Rockridge Market Hall, at 5655 College Ave. at Keith, Oakland. The five-sausage sampler at Schmidt’s. The sampler plate at Jasper’s. October is upon us already, which means it’s time to toast fall German style. Check out these Oktoberfest deals around town, and get your beer on! Over at ~SCHMIDT’S~ in the Mission, you’ll find a bunch of special eating and drinking options from October 1st-31st. They’ll be serving five special Märzen beers over the course of the month, or you can check out an Oktoberfest beer flight with three different beers plus a pretzel roll and a side of German mustard for $14. 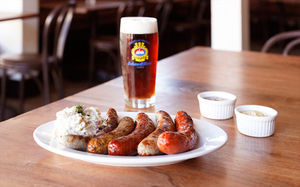 In addition to their regular menu options, there will be sausage sampler plates to go along with your beers. For $18, check out the plate with three sausages, or for $24, you’ll get five different sausages. Both plates include potato salad, sauerkraut, and mustard. They’re open for dinner Sun-Mon 5pm-10pm and Tue-Sat 5pm-11pm. 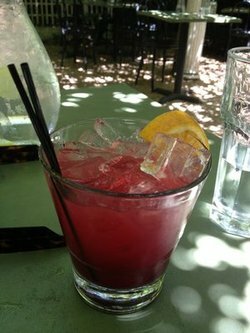 Happy hour is 5pm-7pm every day and brunch is 11am-3pm Sat-Sun. 2500 Folsom St. at 20th St., 415-401-0200. If a party is more your style, the ~PRESIDIO SOCIAL CLUB~ has you covered. On Sunday September 30th, they’ll be throwing a Bavarian-style fest of their own on their hopefully sunny back deck (stay away, Karl the fog! )), with sausage samplers and German beers. Sausage plates with three links and a pint of beer will be available for $10 during the party, which will be from 11am-7pm. You’ll also find sausage plates in addition to the regular menu during the month of October. The party will be the kickoff for this month’s Sunday Supper series, which will feature a whole roasted pig with braised red cabbage and German-style potatoes, plus apple strudel to finish. The suppers will start at 5pm every Sunday in October and cost $35 per person. 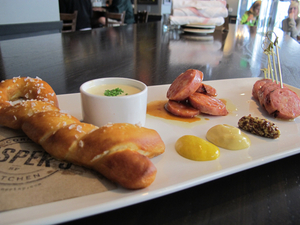 For more sausage and beer offerings, you can hit up ~JASPER’S CORNER TAP~ for a special Oktoberfest sampler plate with spicy beer sausage, whiskey fennel sausage, two mustards, and a pretzel with smoked cheese fondue. The plate comes paired with Paulaner Oktoberfest Märzen beer for $19, or you can get the plate solo for $14 or the beer solo for $7. The sampler plate will be available from now until the end of October, during lunch and dinner. Lunch is every day from 11am-5pm, and dinner is Sun-Wed 5pm-10pm and Thu-Sat 5pm-11pm. A drink on the patio at the former Somerset. Yelp photo by Joshua E.
Some cool haps in Oakland: according to Scoop, James Syhabout (Commis, Hawker Fare) is going to be taking over Somerset on College Avenue: “He’s still ironing out the details in terms of the exact concept, but says it will be casual, with a full bar—‘something fun.’ ” He’s partnering with Alan Carlson of Italian Colors in Montclair, and the chef is Benjamin Coe (he’s been at Commis for two years as chef de partie and was also opening sous at Morimoto Napa). There will be 70 seats, plus 30 on the outdoor patio; look for an opening in 2013. 5912 College Ave. at Chabot, Oakland. Meanwhile, according to permits, Somerset owner Gary Rizzo will be opening a project called ~DESTINO~ in the former La Taza de Cafe/Taste of Joy BBQ space. Stand by for more. 3909 Grand Ave. at Sunnyslope, Oakland. Diablo Mag notes Chris Pastena (Chop Bar) has a new project in Oakland’s Tribune Tower, ~TRIBUNE TAVERN~. Eater shares the 150-seat restaurant and bar will feature American food with local ingredients, housemade items (cheese, bread), and local beers (with some exclusive brews by Linden Street Brewery) and California wines. Romanowski (who recently redid the Lower Haight’s Nectar) is contributing to the design. Mid-March 2013 is the current opening plan. 409 13th St. at Franklin, Oakland. Looks like there’s a new sports bar called ~HALFTIME SPORTS BAR~, with a couple Yelpers excited about the flat-screen TVs, booze, and Kobe beef meatball sub. The spot is owned by James Dailey, and according to his daughter, Jasmine Dailey, they’ve got a pretty classic sports bar menu going on, with a chicken Parmesan sandwich, buffalo wings, and crispy fries. Everything is freshly made in-house (they don’t even have a freezer), and there are a total of 14 TVs, so you can catch pretty much any sporting event you might be interested in. There’s also a room upstairs for fight nights or large groups. Hours are Mon-Thu 11am-12am, Fri 11am-1am, Sat 10am-1am, and Sun 10am-12am. The kitchen generally stays open until 10pm or so, depending on how busy they are. 316 14th St. at Webster, Oakland, 510-836-4400. Lastly, next Sunday October 7th, ~NICK’S PIZZA~ is hosting their second seasonal community meal, offering free pizza, salad, and beverages from 5pm-7pm (for the last one, chef-owner Nick Yapor-Cox made almost 40 pizzas). More details here. 6211 Shattuck Ave. at 62nd St., Oakland, 510-658-3903.